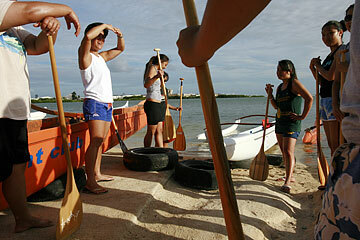 Women from the Waikiki Yacht Club took a break during practice Thursday at Keehi Lagoon Park. The club had to relocate due to the contamination at the Ala Wai Canal. Some canoe clubs that practice in the Ala Wai Canal may not return this summer, even though the canal's water quality appears to be cleaner or, some would say, less dirty than it was before the sewage spill. "I think it's best to be safe for one season," said Luana Froiseth, a board member of the Waikiki Surf Club, which normally practices on the Ala Wai but has been training at Keehi Lagoon since 48 million gallons of raw sewage were spilled into it March 24-29. "We want to go back the Ala Wai, that's our home," Froiseth said, but she said she'll recommend the club stay away for a year "and let the water heal itself." Water quality in the Ala Wai the week of April 18-22 was as good as its average from September 1987 to December 1998, said Watson Okubo, head of the state Health Department's water quality monitoring division. The problem is, the Waikiki drainage canal's water quality hasn't been good for decades. "We know that the venue is fantastic and that the water quality is not that great," Okubo said. "But they've been doing this for many, many years. To have us just close the area off would be a simple solution for us (the Health Department), but it would have a great impact on the canoeing community." Enterococci bacteria -- the state's official indicator of the likelihood of people getting sick from contact with water -- averaged 128 colony-forming units per 100 milliliters of water at the Ala Moana Bridge April 18-22, compared to 180 historically, Okubo said. At the McCully Street Bridge, the bacteria measured 163 for April 18-22, compared to 232 historically. All test results are given as the geometric mean of at least five samples, the method approved by the U.S. Environmental Protection Agency. The state considers an average of no more than 7 colony-forming units as safe for recreational use. During the March spill from the city's Beachwalk sewer force main, Enterococci levels in the canal shot as high as 780,000 colony-forming units per sample, according to Health Department tests. Regular testing of the canal was stopped in 1999, Okubo said, because it was clear the water wasn't going to meet state standards for recreational waters. Testing was resumed during the spill and will continue until further notice. Since 1999, the canal has been permanently posted as contaminated, with no swimming or fishing allowed. At least eight clubs that use the Ala Wai and three clubs that call Magic Island home have relocated practices since the huge spill. Alternate venues include Kaimana Beach, Maunalua Bay at Hawaii Kai and Keehi Lagoon, the latter two of which are already home to a number of other clubs. Boys from the Waikiki Yacht Club practiced at Keehi Lagoon Park on Thursday afternoon. According to their coach, John Stasack, the club has been practicing at the lagoon for three weeks, which can be an inconvenience since there is no secure area for their gear. Oahu's two Hawaiian outrigger canoe racing associations met with Okubo and city water quality officials last week to learn about water conditions in the Ala Wai. Both organizations -- Na Ohana O Na Hui Wa'a and the Oahu Hawaiian Canoe Racing Association -- will hold meetings this week to pass information along to representatives of their member clubs this week. OHCRA President Hannie Anderson and Hui Wa'a Tamry Young both said it would be up to individual clubs whether or when they return to the Ala Wai Canal. "Nobody wants to get sick," Anderson said. "Even though the readings may be back down, we'll all be wondering." Any clubs that do return to the Ala Wai will be asked to have paddlers rinse well after paddling, keep a first-aid kit for injuries and report any illnesses to the Health Department, Okubo said. In statements posted on Web sites last week, both Oahu canoe associations assured members that their 2006 regatta season would be held as planned and that the city and county would allow clubs displaced from the Ala Wai to continue practicing at alternate locations. 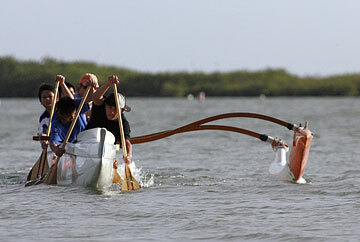 Hui Wa'a regattas began yesterday with races at Keehi Lagoon, while OHCRA regattas begin June 4.